· Model – It contains the business logic of the application. · View − It is contains the HTML part to render at the user end. 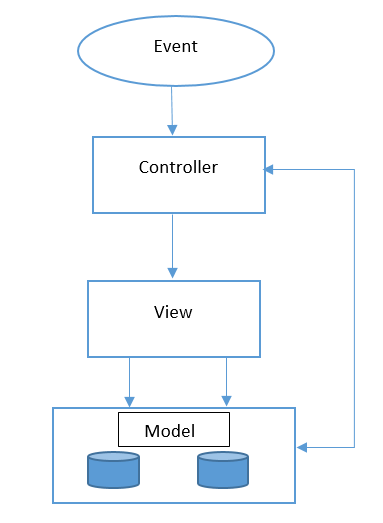 · Controller – It will perform the interaction between view and the model. For any user input the request goes to the controller, then controller makes the call to model for data input, processes the data and sends the data to view to display. 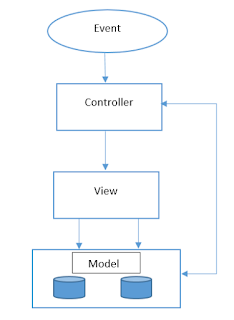 AngularJS mostly work with MVVM design pattern, any change in the view will reflect in the model and any change in the model will reflect to view. Model – View: Any changes in the value of model will update the value in the view. View – Model: Any changes in the value of view will update the value in the model. NOTE: AngularJS is not fully MVC but it follows MVVM because of its two way binding.